It was a fairly benign thing. 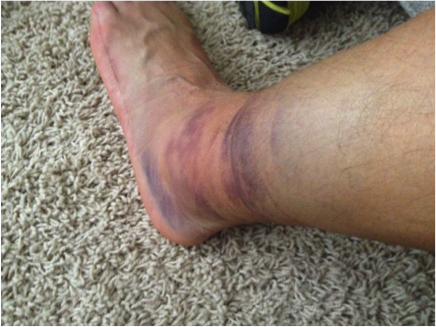 I was doing a simple CrossFit workout and when coming down from a rope climb, I simply misstepped and turned my ankle. One very loud “pop” and instantaneous swelling had my stomach in a knot, because I knew something bad had happened. For the entire weekend, I rested. I made an effort to follow to the RICE principles (Rest, Ice, Compression, and Elevation). I got an X-ray at the OrthoCarolina Sports Medicine Center which was negative for any breaks. After coming to grips with this injury I started formulating a plan. I wasn’t going to be dumb and try to push through. I had a contingency plan. I’ll just run next year, I thought. For two weeks I did nothing high impact. No running, no jumping. Nothing more than simple walking. I kept my conditioning up on this tortuous machine called an Aerodyne. While my Tuesday night run partners were running intervals, I was pedaling furiously. Then something happened: I began to feel pretty good. And while the swelling was still mild the pain was very minimal. I did a light test jog without ill-effects. Whoohoo!! Maybe this race will still happen. I am 4 weeks out from the initial injury and I can confidently say I’m back on track. My weekly mileage is right where it needs to be for me to have a successful race. If there is a message in all of this it’s the old adage “listen to your body”. I once read that you should “work through fatigue, never through pain” and that’s great advice. True “pain” is your body sending you a message that something is not right. As a medical professional, specifically working in orthopedics, I’m frequently asked “What should I do about ___?” The vast majority of injuries I see in the office are simple sprains/strains. Don’t be so hard on yourself. Give your body a chance to heal itself. We live in a time where we become frustrated with waiting. We say “I don’t have time for this!” when in reality, we have nothing BUT time for this. Don’t be so impatient. Adhere to the RICE principles. Slow and steady. And if you aren’t improving after a couple of weeks, come see me!